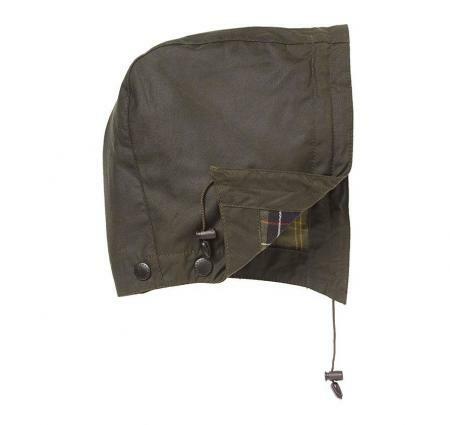 With pure cotton Barbour tartan lining, these Barbour hoods are studded for attachment to the appropriate Barbour jacket collars. Barbour hoods are large sized for optimum protection, there is a removable stiffener in the brim of the hood, to hold position, for the optimum combination of visibility and protection. Drawcord fastening. This one size Barbour hood fits all. PLEASE NOTE THE MHO0001OL91 FORMERLY A861 OLIVE HEAVYWEIGHT to match jackets A820 and A825 IS NOW DISCONTINUED. Your next best option is this hood, the MHO0003OL71 FORMERLY A860 OLIVE MEDIUMWEIGHT. Heavyweight Barbour sylkoil. Pure cotton Barbour tartan lining. Corduroy collar studded for optional hood which are also listed on this web site. The corduroy collar also works well with the pewter wildlife badges in our gifts section. Two large bellows pockets. Two handwarmer pockets and zipped wallet pocket. Two washable, detachable inside game pockets. Interactive with zip-in liners. Long length is what differentiates this jacket from the others in the range 38-39 inches (97-99cm.) Available in olive only, as shown.